The smiling land . . .
Will gather lilies at the break of day.” — J.H.D. Here are some meditations on time, hope, faith, courage, the wonders of creation, knowing and following Christ as Savior and living in the life you build. More devotional messages can be found on the main page on this site and at http://www.the-rockery.com. And yet, if you’ve happened to come upon these words at the start of a new year, much of the world is upon the time when folks reflect upon the time – the year – that is past and look forward to the time – the year – that is to come. A new year of promise and challenge. What will we make of it? It seems we’re running, running, running. But where to and what from? What are we doing with our time? And this man had done everything, seen everything. He’d studied. He’d acquired. He’d amassed. He’d taken on great projects, built houses, cultivated vineyards, planted gardens, set out parks and constructed reservoirs. He’d denied himself nothing. But, all of it, all of his activity had left him empty. He saw all of it as meaningless, a chasing after the wind, because he knew he couldn’t take any of it with him and he couldn’t redeem the time. But even if we could earn, steal, borrow or inherit more hours, it would make no difference, the author of Ecclesiastes concludes, because our fates would still be the same. The fate of the fool will overtake the wise as well. Like the fool, the wise man too must die. And so, he despairs: what is the point of it all? Why bother? Why? Why go through all of these things? So that we will learn to fear God, to obey Him, so that we will learn through our labors to turn to the Lord, to seek Him, to seek our purpose in serving Him. He has placed eternity in our hearts. Deep within, we know there is more beyond the few years of existence we are given on this plane. We can’t fathom what God has done from beginning to end. We don’t have to fathom what He’s done. We need only to ensure that our eternity is safe, that we have accepted His provision of salvation, and that – while we have time, while we are in time — we are working to please Him. And, if we begin to look at our lives from an eternal perspective, we will be able to take greater pleasure in all that life brings us – the times of trial as well as the times of ease. We will be able to have peace in all circumstances because we know the Lord is in control, He means us well and He uses all things to benefit those who love Him. He is working in all time, outside of time and at all times. And He makes all things beautiful in His time. In 1Corinthians 13, we’re told that what does endure is faith, hope and love. John, chapter 6, assures us that spiritual food, which the Son of Man – Jesus Christ – gives us, endures. What else endures? Truthful lips (Pr. 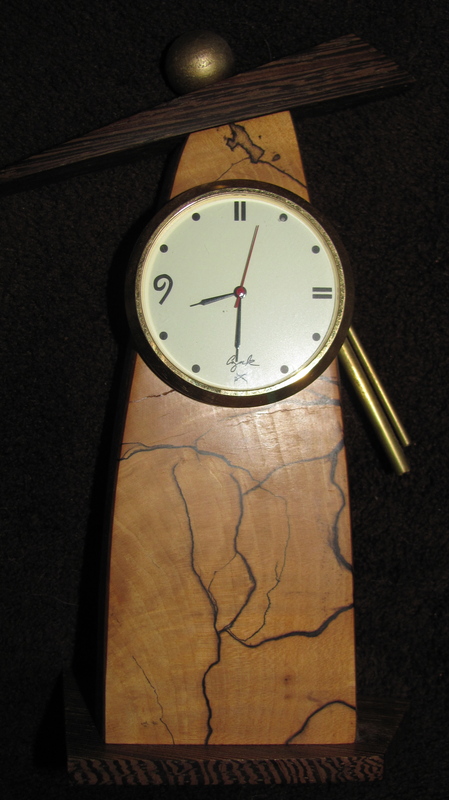 12:19), God’s righteousness (Ps. 112:9 and 2Cor. 9:9) and all of our labor done for the sake of the Lord (1Cor. 15). Matthew, chapter 6, assures us that treasures, laid up in heaven, endure. And where our treasure is, there will our hearts be also. We too will endure. Great and Eternal God, Your love for us never ends. You remain constant and faithful through all the seasons of our lives – from birth to death, in times of weeping and in times of laughter, in times of mourning and in times of joy, in times of war and in times of peace, in the silence and in the clatter and the clutter of busy lives. Lord, you have set eternity in my heart and so I commit my ways to You and pray that Your Holy Spirit will indeed guide me into all truth. May You sanctify me and preserve me. I used to be a mall rat. I’m not one anymore. Now — only when absolutely necessary – do I drag myself to one of the mega shopping meccas. Then I run in, get what I need and run out. However . . . Some time ago – as I was running out — something caught my eye that stopped me in my tracks. It was a display for a new product: oscillating mascara. Oscillating mascara? Yep. Lancome and some other cosmetic lines are now marketing battery-powered mascara. Jean-Louis Gueret, creator of mascara brushes for Lancome, said he came up with the idea for oscillation after watching makeup artists at work. While applying mascara, their hands move in a zigzag pattern. So to best emulate the movement, Gueret explained, he came up with a flexible, polymer-based mascara brush that vibrates along its longitude at 7,000 micro-oscillations a second. To launch the battery-powered movement, one presses lightly on an area of the mascara’s outer tube that turns on a three-centimeter motor. Well, I just stood there in the aisle . . . riveted and then I burst into great gales of laughter. But now I feel like crying. There, in front of me, was a perfect example of being acted upon vs. acting. Now, you can take a stick, put it up to your eye and voila! — perfectly organized eyelashes. I’ve researched the modern equivalent of the biblical talent and have come up with a range of estimates. In one place, I read that one talent was a worker’s average income for anywhere from three to 38 years worth of work. So, if we come somewhere in between and say 15 years, five talents would be the income for 75 years of labor, two talents the income for thirty years of labor. In another place, the author calculated today’s value by drawing from the talent as used in military pay. During the Peloponnesian War in ancient Greece, a talent was the amount of silver needed to pay the crew of a trireme (a warship powered by 170 plus oarsmen) for one month. Hellenistic mercenaries were commonly paid one drachma for every day of service; 6,000 drachma made a talent. Based on this fact, assuming a crew of roughly 200 rowers paid at the basic pay rate of a junior enlisted member of the US armed forces, a talent would be worth nearly $300,000. But, for our purposes today, let us think of the talent as not just a measure of finances but a measure of the amount of gifts, resources and abilities that God has given to each one of us. So what happened here? In our story, all three individuals were given good gifts. All three were given good talents and resources. Not one of these servants earned the resources or talents that they were given. We need to understand that all of the talents were pure gifts from the giver of gifts: God. Not one talent was earned nor deserved. Notice that the “five talent” person and the “two talent” person did not get into psychological games about who had the most talents. They didn’t get into games about “I am superior because God gave me five talents” or “I am half as good because God gave me two talents.” There were no “comparison games” being played here. Now, in our story, the one who had received the one talent went off and dug a hole in the ground and buried the talent he’d been given. Remember this talent wasn’t anything to sniff at; this was an enormous waste! Every one of us has received clusters of gifts, clusters of resources. Each and every unique one of us. But, we can bury those treasures – as did the third person in this parable – we can bury those treasures. But, like the three in our parable, we will also face the moment of settling accounts. We, too, will need to face the giver of gifts to explain how we used what He gave us. And you see the joy here of those who put their talents to good use. They were happy and God was happy with them. How precious to hear the words from our Lord: “Well done, good and faithful servant.” We hear this phrase on judgment day in the Book of Revelation and also in the words of the Apostle Paul. We want those words said about us on our judgment day. But note the way the giver of gifts responded to the one who had buried his talents, “You wicked and lazy servant! You knew, did you, that I reap where I did not sow, and gather where I did not scatter? Then you ought to have invested my money with the bankers, and on my return I would have received what was my own with interest.” This individual tried to blame God but it didn’t work. God saw through his “blame-game.” So the talent was taken from him and given to the one with the ten talents — the one who would put the talent to good use. Mary Schramm has written a book entitled, Gifts of Grace. She suggests that there are five steps in ascertaining and using your gifts, and I would like to walk through those steps with you. Will you settle for being acted upon or will you act? Are you using, will you use, your God-given talents or will you bury them? Are you being a good steward of what the Lord has given to you or have you abandoned your responsibility? If you have buried what you’ve been given, ask yourself: is it because you’ve become stuck in a pattern of blaming others for your circumstances? Well, it’s high time you dug down deep to draw up that talent. Claim the abundant life the Lord has for you. If you keep doing things the way you’ve always done them, you’ll keep getting the same results. Make today different. Resolve TODAY to be a more faithful steward of all that the Lord has bestowed upon you. WHERE WILL YOU FIND JESUS TODAY? 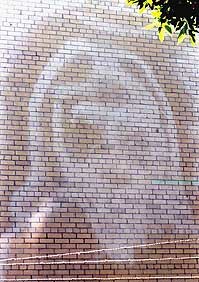 Folks have claimed to see the likeness of Jesus in a fireplace brick, in paint on a wall, in a piece of sheet metal, in the dirt on a truck’s tailgate, in a tortilla, in a pierogi, on a fish bone, on a shrimp tail, in a dental x-ray, in a couch pattern, in an overspill of hot chocolate on a mug and on a water-stained piece of plaster in a bathroom. This last one, called “Shower Jesus,” sold on eBay for $1,999.99. Now, we have no photographs of the genuine Jesus: the images we have in our minds are there primarily from the imaginings of artists through the centuries. But I admit I am fascinated by folks’ fascination with finding Jesus and looking for signs of His continuing presence in our lives. Jesus told us to “be ready, because the Son of Man will come at an hour when you do not expect Him.” And, though He was referring to the endtimes, Jesus is forever coming unexpectedly into our everyday lives. He is always surprising us: through a circumstance, a place, through a telephone call, through a “chance” encounter with another person, through a conversation with a family member or friend. If we take a moment to consider, if we are alert, eyes open, senses sensitive to His presence in our lives, we can see Jesus there in that situation, in that conversation, in that experience. We Christians are to live with the expectation and alertness that God’s kingdom, God’s possibilities, God’s opportunities are forever before us and around us, breaking into our lives. Where will you find Jesus today? Hope. Look online and you’ll find 2,300,000,000 references to the word “hope.” Quotes about hope abound. But then we come across the novel writer Snoopy, of Charlie Brown comic strip fame. He opens a story with: “It was a dark and stormy night …” Snoopy always starts his stories in this way. Lucy looks at what Snoopy has written and goes into a tirade, berating Snoopy for such a silly beginning. Doesn’t Snoopy know that any good story starts with the words, “Once upon a time”? The last frame of the comic strip has Snoopy starting his story again. Now he is ready. He types, “Once upon a time, it was a dark and stormy night.” Do you feel like Snoopy sometimes? No matter how you begin your story you somehow revert to “a dark and stormy night.” If you feel that way today you’re not alone. Many of us are struggling in one way or another to overcome the dark side of our existence. We hear again and again that the Advent season leading to Christmas should be a time of joy, anticipation and hope. But, the very fact that it is supposed to be such an upbeat time only compounds the problem. Some of us don’t like the short days and the long nights: too much darkness, not enough light. Others of us are living from paycheck to paycheck and feeling the pressures of our American society, compelling us to spend extravagantly (even beyond our means) on our families and friends at Christmas. And, if/when we yield to those pressures, we know we’ll be worrying after December the 25th how we’re going to meet our bills and pay down our credit card balances. Still others of us are worried about our health or about the health of someone in our family or circle of friends; and, of course, the passing of loved ones is usually felt most keenly in this season. If we are struggling with loneliness, a lack of direction, a feeling that we are cast adrift without much hope, where can we turn to find the way through our own dark and stormy nights? The Apostle Paul provides us with a clue when he states: “For everything that was written in the past was written to teach us so that through endurance and the encouragement of the scriptures we might have hope.” According to Paul, the expressed purpose of the scriptures is to instruct us, to keep us steadfast and to give us hope. The Bible tells us and life bears out that our God is a God of overflowing goodness and kindness who takes care of His people and never abandons those He has called to enter into relationship with Him. That is the source of biblical hope. If God is good and never changes his attitude nor forsakes us, then whatever difficulties may arise can be seen in the context of God’s love, sovereignty and eternal care. God works all things for the good of those who love Him . . . even dark and stormy nights and days of great uncertainty. Advent is a season of waiting, waiting for God to appear. Perhaps this day, you’re waiting for God to appear in medical test results, waiting for God in the provision of resources, waiting for God as you’re faced with a big decision. Waiting for God to appear. He is with you and, if you are not only waiting but truly seeking Him, you will find Him and you will find the answer you need, the answer that will be of the greatest benefit to you. Just keep in mind that God is a God of surprises and the answer may well be one you’re not anticipating (remember Salvation came wrapped in swaddling clothes and was placed in a manger). In this Advent season – as we read the promises from the Old Testament, such as those found in Isaiah 9, and see those promises fulfilled in Jesus, as recorded in Luke 2 (see The Rutter for these passages) — we can be certain that, in the same way, God’s Word has a promise to suit our personal need and God is true to His Word. He will not fail you. Make this scriptural hope your own. Believe in hope and live in hope. Paul’s words in Romans 15:13 constitute a blessing and it’s the one that perhaps we might all memorize so that we may encourage one another: “May the God of hope fill you with joy and peace in believing that you may abound in hope by the power of the Holy Spirit.” Amen? Discovery leaves the launch for the 39th and final time. February 24, 2011. Photo by NASA. Discovery, the world’s most traveled spaceship, was recently launched into orbit for the 39th and final time, heading toward the International Space Station on a journey that marked the beginning of the end of the shuttle era. 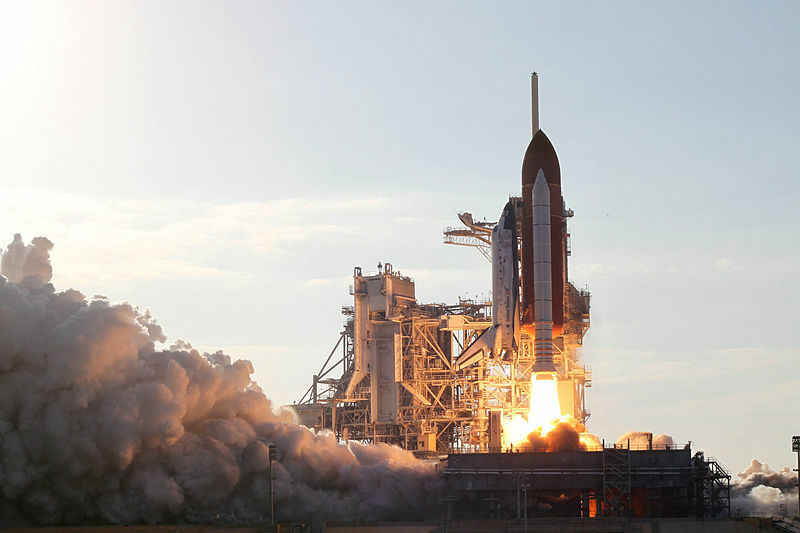 Two missions would follow, first by Atlantis and then Endeavour, to end the 30-year program. With a crowd of many thousands, I watched the lift-off from Titusville’s Space View Park. The launch pad was in my direct line of sight across the water and it was a thrill to hear the rocket engine blasts, to see the golden glow, and to feel the thundering rumble. The vehicle reached orbit within 15 minutes of launch. It was in the naked-eye sight of those below for only 8 ½ seconds. The six astronauts on board returned 11 days later and now Discovery will find a new home at the Smithsonian. An estimated 40,000 guests gathered at Kennedy Space Center to witness this history-making moment. Discovery frenzy took over not only the launch site but neighboring towns as well. “Did you know approximately 150,000 people die every day? The Bible explains why each one of us will die. We have all broken God’s uncompromising laws, the Ten Commandments. Have you ever told a lie? Stolen anything? Looked with lust? Used God’s name as a swear word? Then you have already broken 4 of the Ten Commandments, 6 more to go! Talk about a launch! If you’ve never invited Christ into your life, why not do that today? And, if you are a follower of Jesus Christ, today would be a good day to recommit your life to Him! Amen? 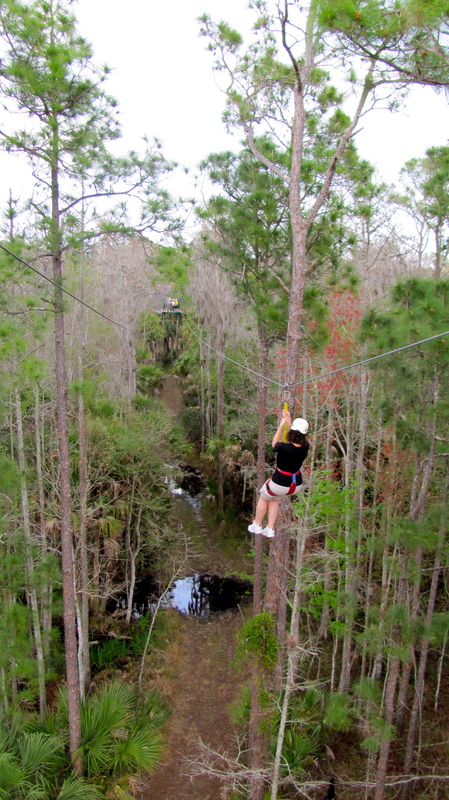 One afternoon, I participated in a “Zipline EcoSafari” at the Forever Florida Park in St. Cloud. To get us up where we needed to be, about a dozen of us climbed a five-story tower to the first ziplines. 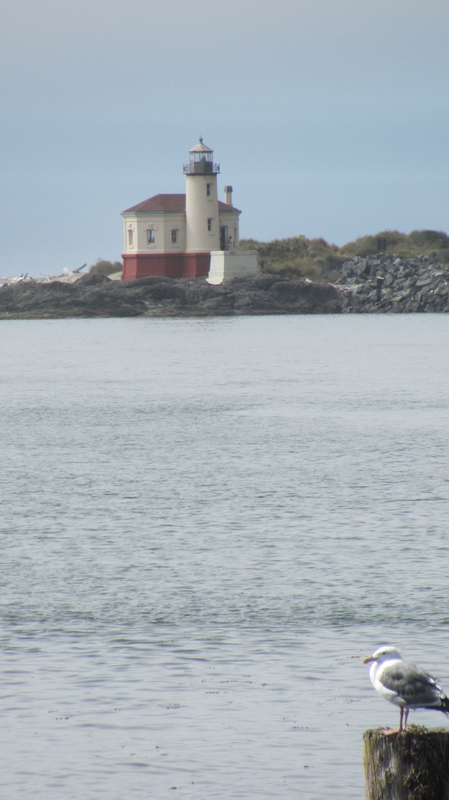 I was surprised and quite disappointed to find myself filling with trepidation as I considered what I was about to do. After all, when I was little girl, I used to jump off the garage roof with an open umbrella in hand hoping to float off like Mary Poppins. It was also very important to me in those years to make a climb each day to the highest branches of the pines in the grove on our property. As an adult, I’ve trained on and crewed on hot air balloons. I’ve flown in a range of aircraft from commercial prop and jet planes to helicopters to military refuelers. I love being aloft. But…here I was heart pumping away. I’m certain apprehension was all over my face. My lanyards were hooked on the line. I took the initial step into the air and was propelled across to the second tower in the series. I was so relying on myself and so focused on getting safely from point a to point b that I missed hearing some key directives. I didn’t turn my lanyards so I could come in straight and, instead, spun around backwards and had to rely on my guide to catch me on the other tower. I took little pleasure in the journey and missed seeing the beauty of the Pine Flatwoods and forested wetlands around me. We can approach all of life like this: allowing our fears to distract us and becoming so self-focused we can’t hear the guidance of the One who can bring us safely along the journey. When we do live like this, we miss out on the glories — the bounty — the Lord has set all around us. I am happy to report that by the time I reached the third tower, I was flying straight and reveling in the experience. I was delighted to finally hear my guide say, “Good job!” when I landed and I pray I’ll take the lessons of the day to heart so I can fly straighter today and revel in the experience. “Trust in the Lord with all your heart and lean not on your own understanding; in all your ways acknowledge Him and He will make your paths straight” (Proverbs 3:5-6, NIV). For its inspirational power, I would commend to you the film Amazing Grace, which chronicles the life of William Wilberforce and his heroic campaign to abolish slavery in the British Empire in the early 1800s. Wilberforce’s deeply-held Christian convictions moved him to work for the transformation of the society in which he lived and he was used of God in astonishing ways. He was not only instrumental in ending the slave trade; he also worked with the reformer, Hannah More, in creating the Association for the Better Observance of Sunday. The goal was to provide all children with regular education in reading, personal hygiene, and religion. He was one of the founders of the Royal Society for the Prevention of Cruelty to Animals which inspired the creation of such societies all over the world. And he also worked to encourage Christian missionaries to go to India. 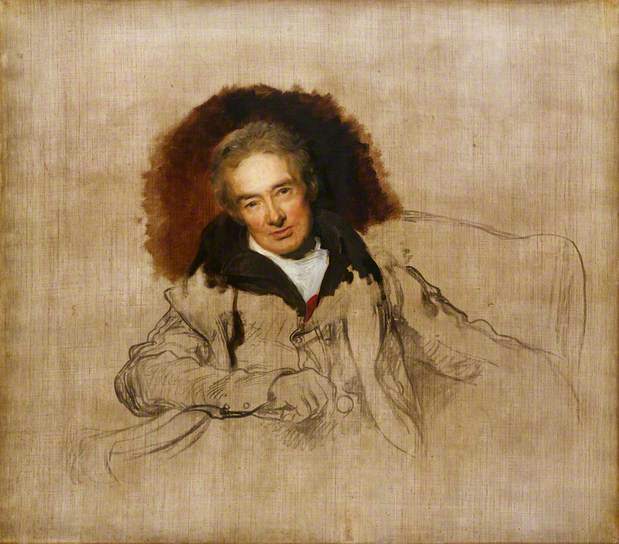 In 1797 Wilberforce published A Practical View of the Prevailing Religious System of Professed Christians in the Higher and Middle Classes of this Country Contrasted with Real Christianity. Under the shorter title, A Practical View of Christianity, the book is still in print today and is continuing to have a powerful impact. Lord Fox went on to say that a Napoleon comes to mind when we speak of greatness but Napoleon was ruthless and surrounding all he did were his personal ambitions and the horrors of the wars he waged. Ultimately, he suffered complete and utter defeat; he was conquered. Wilberforce, on the other hand, having completed his selfless quest for justice, would go home to his family, lay his head on his pillow, and go to sleep knowing he had truly changed the world for the better. Wilberforce is a true hero. Do we aspire to such greatness? Do we work to instill in our children, in our grandchildren, do we encourage in our friends, in our fellow Christians such an aspiration to greatness? Do we expect of ourselves and our fellow Christians a saltiness that preserves the good and brings a refreshing flavor to all of life? Let us pray that our Heavenly Father will give us the courage to strive for the highest goals, to flee every temptation to be mediocre. Let us pray that He will enable us to aspire to greatness and that He will open our hearts in joy to His call to holiness. May He free us from the fear of failure and shake us all out into the world. My husband Gene and I have been reading a book by Alexandra Horowitz entitled Inside of a Dog: What Dogs See, Smell and Know. 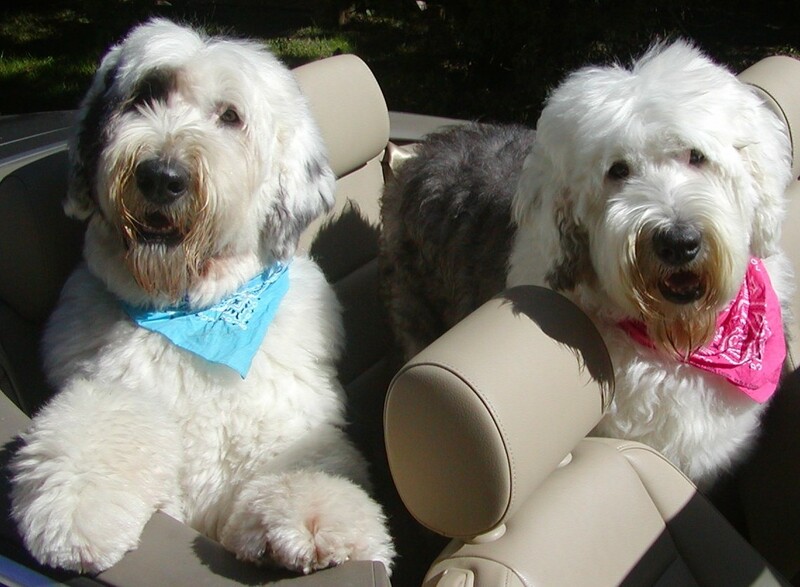 Each chapter has moved us toward greater and greater appreciation of the abilities of our two Old English Sheepdogs Mac and Molly. We believe the better we understand them the better we’ll be at communicating with them. What a magnificent God we serve, a God who has created such extraordinary creatures, a God who has created an astonishing realm of breathtaking beauty and glorious intricacies! May we celebrate this day this world of whom He has made us stewards and widen our eyes to its amazing wonders! “And God said, ‘Let the land produce living creatures according to their kinds: the livestock, the creatures that move along the ground, and the wild animals, each according to its kind.’ And it was so” (Genesis 1:24, NIV). Some time back I officiated at a memorial service for Norma, a member of the church staff I led. For most of her life, Norma was a single Mom who worked full-time jobs and raised four kids on her own. For the last eight years of her life, Norma fought against an ovarian cancer that eventually moved to her bowel and chest cavity, ravaging much of her body. Her testimony of courage, perseverance, positivity, joy in the face of the most serious of trials and her deep, powerful, abiding, unwavering faith under pressure left a powerful impression on me and on others who were privileged to know her. You never heard her complain; you never heard one word of self-pity. Even on her most trying days, when she was in great pain, her thoughts were for others and what she could do for them. In her last days — as she began her leave-taking from this earth — she had no fear and she was ready to go home to the Lord. For the service celebrating her life, the sanctuary was filled to the brim with folks who loved her, admired her and learned from her. I contrast her testimony of faith with another person I know who has had genuine troubles in her life – some medical but many troubles of her own making– and she takes every opportunity to complain to anyone who will listen, railing on and on about every ill in her life, choosing to feel sorry for herself, choosing to be miserable, choosing not to change. If she continues on as she’s going – alienating everyone and leaving destruction in her wake — she will come to the end of her life and she will be completely alone. When troubles come, and they will, what is left to us is the choosing. What will we do when we encounter troubles, trials, tests and temptations? I have officiated at a number of weddings over the years and there comes a moment in each service when the man and woman vow to love each other for better, for worse, for richer, for poorer, in sickness and in health, till death would take one or the other home to the Lord. We seem to know that every marriage, at some point, will have troubles, trials, tests, and temptations. What folks do when they utter their marriage vows is to make a commitment not to deny the reality of troubles, but to outlast the problems that troubles can bring into a relationship. The same is true in all of our relationships. James is saying that true faith in God not only abides in trouble but is actually strengthened by it. If we trust God in the shadows, God will bring us light. So one point to make today is that in this life we must face the fact of trouble. Open a Bible and you’ll see that many of God’s servants–from Noah to Moses, to Amos, to Jeremiah, to Daniel, and even our Lord and Savior, Jesus Christ– experienced moments of trouble and trials in their journey to do and live out the will of God in their lives. The Christian faith gives us the power and perspective not to focus on the trouble, but to focus on how best to overcome the reality of trouble. Troubles are part of our growing up and maturing. 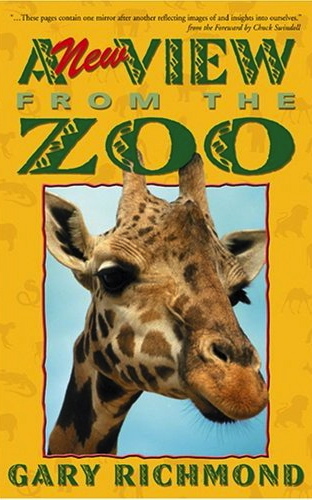 In the book A View from the Zoo, Gary Richmond tells about the birth of a giraffe: “The first things to emerge are the baby giraffe’s front hooves and head. A few minutes later the plucky newborn calf is hurled forth, falls ten feet, and lands on its back. Within seconds, he rolls to an upright position with his legs tucked under his body. From this position he considers the world for the first time and shakes off the last vestiges of the birthing fluid from his eyes and ears. “The mother giraffe lowers her head long enough to take a quick look. Then she positions herself directly over her calf. She waits for about a minute, and then she does what would seem to be the most unreasonable thing. She swings her long, pendulous leg outward and kicks her baby, so that it is sent sprawling head over heels. Now, humans are not to train their children in quite the same way – we’re not to kick our children or throw them as, I was saddened to read last week, one couple did with their toddler. But we can relate to the need to not do everything for our children; parents need to let their children face their own challenges. Before our daughter acquired the ability to walk she had to crawl, and then she began the process of getting up and falling down, getting up and falling down, getting up until she learned to keep her balance. We encouraged her through all the falling downs and getting ups. She’s grown now with her own children and she and her husband are now training their own little ones in the process of getting up when you’ve fallen down. You can spend your life counting your troubles, replaying over and over who hurt you, and how miserable you are OR you can allow troubles to do a good work in you producing a strong character, spiritual maturity and a well-developed faith. You can pick yourself up, dust yourself off and begin remaking yourself today. It’s your choice. Choose well. 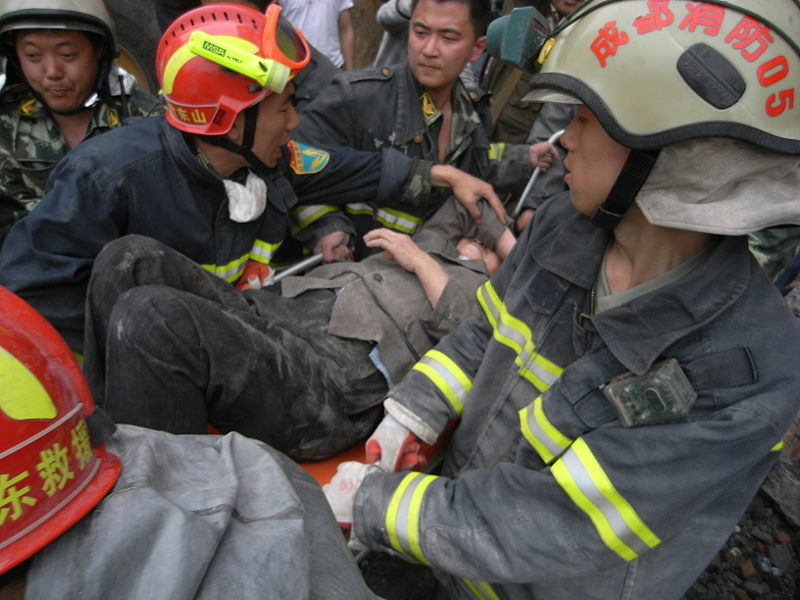 Effecting a rescue (Dujiangyan). Photo by miniwiki. I was struck a few years back by heartbreaking photos out of China of grieving parents standing near collapsed schools in which thousands of children died in an earthquake. Examinations of those schools by engineers and other experts revealed faulty construction and cheap materials. Parents blamed official corruption and negligence for failing to ensure that the buildings were safe. In a New York Times article, an education official in Sichuan province — Lin Quiang — related what he saw after the earthquake. He was one of the first to reach Beichuan, one of the worst hit areas, and there, he saw the destroyed Beichuan Middle School, where hundreds of children died. Yet about 1,000 yards away, Mr. Lin also saw a Hope Project school, which had been built in connection with the Chinese Academy of Sciences. Donors for the Hope Project had strictly overseen construction — and, as a result, the building was largely undamaged. It is significant that Jesus ended the Sermon on the Mount with the parable of the Wise and Foolish Builders. Throughout the long day Jesus had been preaching to the vast multitude. They listened to him with amazement and awe. But Jesus warned them that listening was not enough. It is never enough simply to listen to the words of Jesus, even though we may listen with reverent approval. If His words are to have any genuine effect in our lives we must not only hear them but act upon them. They must be lived out everyday. To drive the point home, Jesus told the compelling story of two builders who each built a home. On a nice day, standing inside these homes, going from room to room, one might notice little difference between them. Even from the outside one might say they were virtually indistinguishable from each other. But, said Jesus, the difference would be found in the foundations, one built upon the rock and the other upon sand. And with no further explanation, the people understood the meaning of that parable: that our lives are like houses. If we build upon a good foundation, when the storms of life come, when we are shaken, our lives will remain intact. If, on the other hand, we build on a poor foundation, when the storms of life inevitably come, when our world is shaken, our lives will be shattered into ruins. Why? Because the foundation is worthless. We all intuitively know the need for good foundations for anything to last. And what is the good foundation according to this story? It is those who hear and do the teachings of Jesus, those who hear and put into practice the spiritual and moral values that Jesus has been describing in chapters five through seven of the Gospel of Matthew. We need to understand that we are all involved in building, and that the house we build is being built according to a code. Let me ask you: what code are you using to build your spiritual home? Now, there are all kinds of building codes in the world. You ask someone in construction or architecture and they will tell you that building codes are a complex and confusing body of regulations. Building code regulations are written, rewritten and interpreted by thousands of builders, manufacturers, architects, engineers, fire marshals and inspectors. To complicate matters, there is no common language, no uniform building code in the United States that acts as a common guide. Some communities develop a unique code while others don’t have a building code at all. In the community that we call the church, we have a common language, a uniform building code and it’s called the Bible. And I would suggest that if you are going to build a home that you start in the fifth chapter of the book of Matthew and read to the end of the seventh. If you are going to build a home, Jesus said, you must build upon something solid. There are no words more solid on which to base your life than these words from the Sermon on the Mount. The Sermon has been called the Christian Magna Carta, the Christian Manifesto, the Design for Life, and the Rules for Christian Living. It contains the Beatitudes, the Lord’s Prayer, and the Golden Rule. It deals with murder, adultery, divorce, oaths, revenge, and worry. It gives instructions on prayer, giving to the poor, fasting, judging others, and saving money. Blessed are the poor in Spirit (in contrast to the spiritually proud and self-sufficient) for theirs is the kingdom of heaven. You are the salt of the earth (preserving the good and bringing flavor to life). You are the light of the world. Let your shine before others that they may see your good deeds and praise your Father in heaven. If someone strikes you on the right cheek turn to him the other also. Bless our Father in heaven and pray deliverance from the evil one. Remember that where your treasure is, there will your heart be also. Do not judge or you too will be judged. For the same way you judge others, you will be judged, and with the measure you use, it will be measured to you. Ask and it will be given to you; seek and you will find. Enter the narrow gate. For wide is the gate and broad is the road that leads to destruction. Beware of wolves in sheep’s clothing. By their fruit you will recognize them. So, it is no coincidence when Jesus wraps up His sermon by saying there were those who were wise and they built their house upon the rock and there were those who were foolish for they built their house upon the sand. Build well. We can have words as in hostile and angry remarks made back and forth. We can have no words to describe a situation or we can describe that same situation in a word. We can also summarize a situation in so many words. We may know a person who is a person of few words. We may take that person at his word because he is a person of his word. We can be wordy or wordless and we can hear news by word of mouth or via wordplay – repartee. I’m re-reading these words that I’ve put on the page in the process of word processing. I’m hoping to convey some words of wisdom but what most concerns me is making certain that the words I use are faithful to THE Word — the Scriptures, the Bible. Now I know that the only way that will happen is if I am leading first with my ears, if I am listening first to God. We are creating our histories today. It matters today and it will matter tomorrow how we respond to God’s Word today. The Word insists that we receive God’s Word by doing it. Hearing the Word is absolutely essential but if our hearing does not lead to doing, if our study does not result in obedience, if our attendance in worship does not lead to a righteous life, then the Word of God has been mistreated and we are deceiving ourselves about the reality of our relationship with God. The test of true worship is not what we do in an hour of worship each Sunday; it’s what we do outside the walls of a church building the rest of the week. After all is said and done, may it not be said of us – as it relates to the Word — that more is said than done. 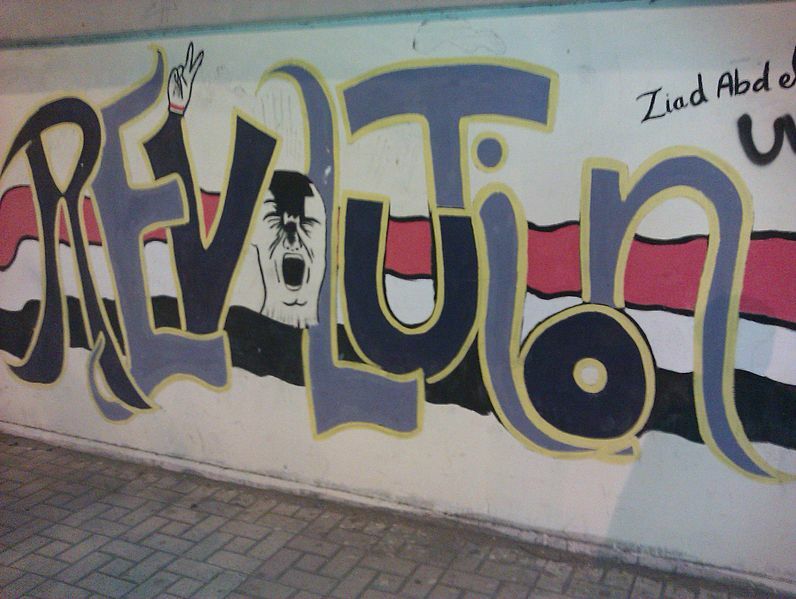 Artwork found on a wall lining a street in Alexandria, Egypt shortly after the revolution of 2011. As I sit to write this morning, I’ve been reflecting back on the revolution in Egypt and praying over the future of the country. When the nation was moving through many days of turmoil, Anthony Shadid noted in the New York Times: “The beginning was as stunning a moment as the Arab world has witnessed, written in the smallest acts of citizenship and the grandest gestures of defiance. From the first day, Tahrir Square represented a model of people seizing the initiative from a hapless government, be it cleaning the streets or running their own security. The very acts seemed an antidote to decades of autocracy, stagnation and festering resentment over their own powerlessness. ‘We’ve discovered ourselves,’ said one of the organizers, Wael Khalil. The last description especially struck a chord with me. As one who calls Jesus Christ Savior and Lord, as one who came out of darkness into the light, as a hapless one in whom the Lord has exercised His cleansing power, as one who now has eternal security, I know what it means to go through a personal revolution, an inner remaking. Let us pray that the Lord will bring this kind of revolution to Egypt. And let us pray that we may be used of Him in our everyday encounters to fill vacuums with the eternal hope found only in and through Jesus Christ. “You’re addicted to thrills? What an empty life! The pursuit of pleasure is never satisfied” (Proverbs 21:17, The Message). On MSN Money, Donna Freedman noted the release of a new study by the National Foundation for Credit Counseling which trumpets that: “a majority of Americans have frugal fatigue.” Some 66% of folks surveyed by the NFCC are feeling the strain of having to watch their dollars. Addictions to thrills, the constant pursuit of pleasure, the reality of temptations…there really is nothing new under the sun. The proven methods for addressing these troubling behaviors are still found in the ever-current Word of God. A lot more prayer and a lot less shopping would do us all a heap of good. “Those who want to get rich fall into temptation and a trap and into many foolish and harmful desires that plunge people into ruin and destruction” (1Timothy 6:9). “No temptation has overtaken you except what is common to mankind. And God is faithful; he will not let you be tempted beyond what you can bear. But when you are tempted, he will also provide a way out so that you can endure it” (1Corinthians 10:13).